Most of the Pridelands were still sleeping as Kion paced around the cave. He'd heard from Ono that there had been trouble in the Outlands. The Guard was meant to check it out at dawn, but Kion was too impatient, he had to go, even if it meant going alone. “It's still dark, I'll be OK” Kion told himself as he trotted across the cool sand, the moon lighting his way. He would never normally do anything so dangerous without the Guard, but it was because it was so dangerous that he needed to go alone. A single scout, in and out, no noise. It wasn't long before Kion reached the edge of his lands. He took a deep breath and crossed the border. He could smell a different, yet familiar scent in the air. Everything was silent. He couldn't even hear birds any more. Scrambling up a hill, Kion knocked a pebble, with clicked and clacked down the dry rock. ”Oops” He whispered. No one was talking, everyone was listening. Someone would have heard that. He stayed perfectly still for a moment, he could hear his heart thumping in his chest. “Phew” he breathed again. Looking over the ledge, he saw the aftermath of a savage fight, there were claw marks, fur and dry blood. 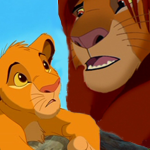 He needed to tell the Guard and his father, Kion turned towards home, when suddenly he was face to face with another lion cub! Even in the dark, Kion could see he had the same red fur and green eyes as the menace Scar. Both cubs gasped! Kion, who was already on edge lost his nerve and ran. The red cub, Kovu, also ran. His fear didn't let him stop until he had reached his mothers cave. Zira, a thin, but powerful lioness lay curled up in a dark corner. She slowly uncoiled herself and sat up. The lionesses eyes darted towards the direction of the Pridelands and almost glowed with fury. Zira soon vanished in the night. Kion ran blind. His legs started to burn, but he was spooked and couldn't stop until he'd reached home. Pride Rock loomed. 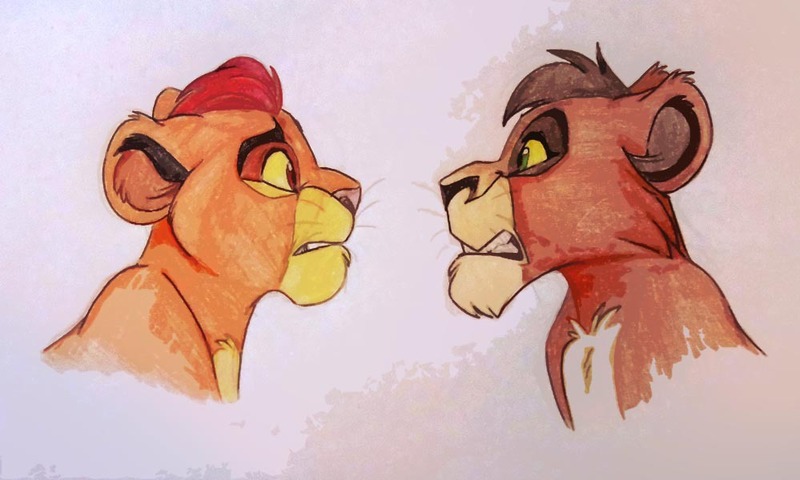 “Mum, Dad!” Kion shouted long before he reached the mouth of the cave. “Kion? Where have you been, what's wrong?” Simba questioned. “I went to the Outlands, I saw blood, another cub! There's been trouble” Kion barely stopped to breathe. “I do” Simba replied. “Send Zazu and Ono to see if they can see him. Get some rest, we'll talk in the morning. Zazu and Ono flew high above the Outlands, they also saw the site of the battle. Janja and his clan were no where to be seen. They followed the trail of blood as far as they could, but it was clear that they had run far away. “Zazu! Look down there!” Called Ono. “We must tell Simba” Zazu replied “I've seen enough!” The two birds flew back to Pride Rock. “It's her! Scars mate, Zira! She has driven Janja and his clan away, she has taken over!” Zazu replied, his voice hushed. The King announced to his Pride to stay inside the boundaries of the Pridelands and not to go near the Outlands under any circumstances. Simba's daughter, Kiara bounced out of the cave, the sun was now up, spreading light across the land. She couldn't wait to get out and spend the day exploring! Tiifu and Zuri were not allowed out, but she was happy going alone. In the Outlands, Kovu was bored. Vitani had wandered off hours ago. Nuka was dozing, so Kovu decided to go and look for the mysterious yellow cub he met. He knew he probably came from better lands than Kovu was used to, so he headed for the borders of the Pridelands. He soon found the river. He had been walking for a while, so sat down for a short rest. He began to day dream about the cub, could they be friends? Why did his mother hate the Pridelanders so much? Scar wasn't his father, so he didn't see why he was the chosen one, why Zira put so much work into him, when he wasn't of royal blood. Then suddenly it hit him. Meanwhile, Kion paced the cave once again. Ono watched him, concerned about what had got the King and Queen so worried. They knew Scar was evil, but who was this lioness they were so afraid of? Why was a pride of lionesses so scary, what could make them different to Janja? “Affirmative!” Said Ono, as he took off towards the Outlands once more. Before Ono had even reached the river, he spotted Kiara and Kovu with his keen sight. “Oh no!” He flapped in fright and flew as swiftly as he could back to Pride Rock. “Hevi kabisa! I think we need to tell Dad” He started to run, but Simba was already there. love both the story and the fanart! nice! This is a great story. Totally loved it.